Its ad claims today's Nice Price or Crack Pipe Mustang GT should have been crushed, as it's said to be a pre-production company executive edition. We'll see if that, and its very unique vanity plate, will prevent its price from becoming a crushing blow. While Cleopatra may have sought out an asp as the means to her end, fully 80% of you felt that the price on yesterday's 1995 Dodge Viper RT/10 would make for a sweet beginning. Prices on these Dodge super cars have been coming down steadily, and one thing's for certain, at some point they are going to go back up, probably way back up. That makes this look like a good time to pick one up - maybe even yesterday's - and then sit on it Potsie until, like a fine wine, it's really effing valuable. One could say that it's always a good time to buy a Mustang. After all, Ford's pony car has offered about the biggest bang for the buck of any ride since its inception in nineteen sixty four and a half. Today's Grabber Blue over black 2010 Mustang GT is unique on two fronts - twonique as it were. First off, this V8-engine'd impresario of the exhaust note is claimed to be a pre-production edition of the 2010 model, originally ordered by then President of Ford Marketing, James Farley. It's also said to sport a bunch of Ford Racing bric a brac and to have been slated to meet the crusher after its Ford-serving days were over. Instead it somehow made its way into private hands, eventually trading its manufacturer's plates for what is the second - and possibly most awesome - aspect of this 'Stang. That of course is its Arizona license plate which reads JALOPNK (cue angels on high). Whoever ordered that (you know who you are) rivals the Zune tattoo guy for brand affiliation, and we love you right back for doing so. It sort of makes my Calvin Klein-emblazoned underpants seem at best a cheap and pathetic attempt at brand buddying. The car to which that greatest plate on the planet is bolted - aside from the Ford Racing bits - is your standard '10 manual GT. That means the 315-horse 4.6-litre SOHC V8 and Tremec 5-speed stick. The ad notes that while not rode hard and put away wet, this pony does exhibit some of your typical wear and tear. There's a couple of minor dings in the body, noted in the pics, and some curb rash on the five spokes. Aside from that it's claimed to run well, and with a little over 86K on the clock, it's probably still got plenty of run left in it. Plus, JALOPNK! There are plenty of Mustangs out there, but how many can claim pre-production bonafides? Or far more importantly, how many come with your favorite car blog name emblazoned in perpetuity on its license plate? How many? Huh? One must put a price on fame, and in this case that price is $32,000. The seller says that he is offering the car due to a lack of garage space, which he says people tell him this car deserves. 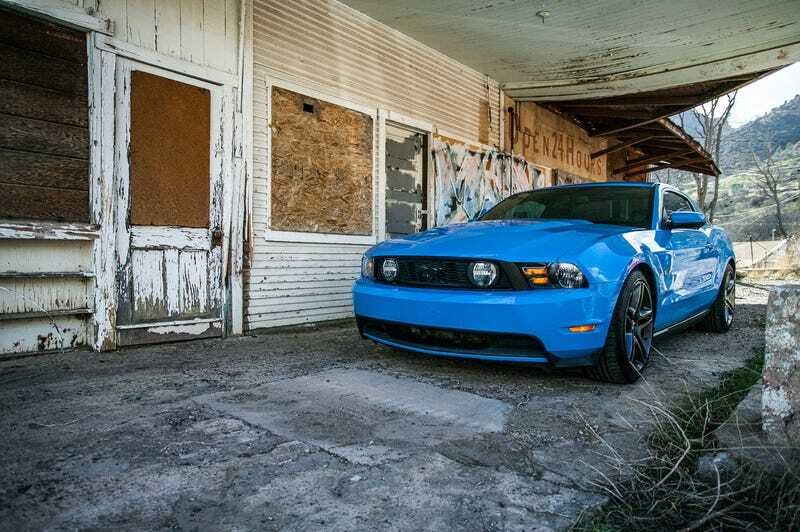 What do you think, does that $32,000 price make this a pony that should easily find a new garage? Or, despite JALOPNK, is this Mustang just too damn expensive?